Txakoli is a dry, young Basque wine that can have a bit of effervescence. You can substitute a dry Riesling, Vinho Verde, or Albariño with equally delicious results. 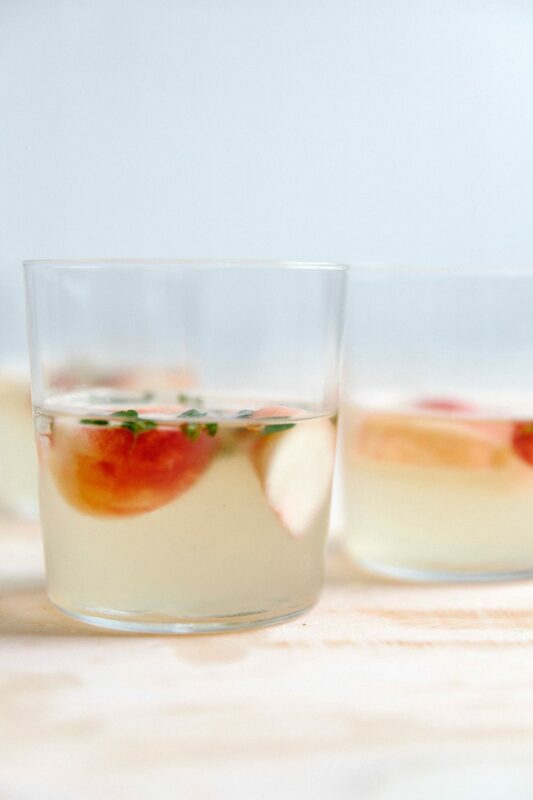 You can also use any type of peach, though Donut peaches work especially well for their pretty color for this gluten free summertime cocktail. Mix the mint, lemon thyme, and sugar together in a large nonreactive bowl. Work the herbs and sugar between your fingers to bruise the herbs a little bit, which helps release their flavor. Toss in the peaches and let stand at room temperature for 15 minutes. Mix in the wine and gin, chill in the refrigerator for at least 2 hours, and serve in chilled glasses.